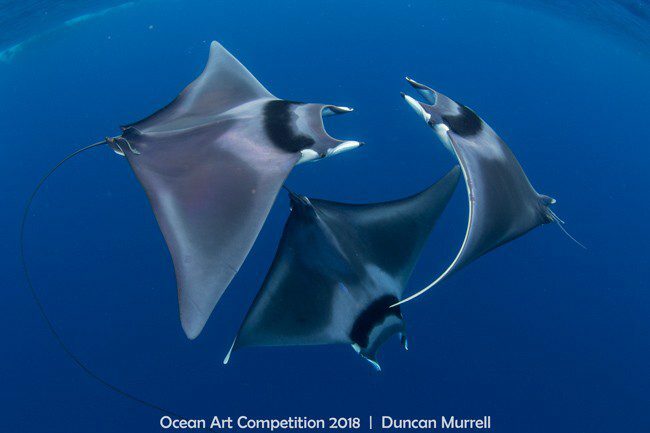 The Best of Show image in the prestigious 2018 Ocean Art underwater photo competition has been judged to be “Devil Ray Ballet”by British photographer Duncan Murrell. He used soft ambient light to accentuate the movements of the giant devil rays and triumph in the seventh annual event, which is organised by the California-based Underwater Photography Guide (UWPG). Murrell came first in Marine Life Behaviour, one of 16 categories designed for all levels of photographer, disciplines and types of camera in the international contest. The three spinetail devil rays (Mobula japanica) were engaged in what was described as rarely observed or photographed courtship behaviour in Honda Bay, Palawan in the Philippines, with two males pursuing one female. Murrell used a Canon 6D camera with 15mm lens set at f7, 1/200th, ISO 500, and won an Oceanic liveaboard cruise to Indonesia’s southern islands, with a 50% discount for a companion. The judges, underwater photographers Martin Edge, Tony Wu, Marty Snyderman and UWPG publisher Scott Gietler, evaluated thousands of entries from 70 countries before selecting the winning sets. “Other exceptional images include some astonishing fish and marine-life shots, rarely seen animal behaviour, innovative shooting techniques, stunning portraits, seals, ocean adventure, whales and some dramatic moments between humans and marine life,” says UWPG. It reckons that the US $80,000-worth of prizes awarded, mainly travel packages and equipment, puts the event among the most valuable in the world. “This year’s outstanding underwater images … continue to raise the bar for underwater photographers,” said Gietler, adding that the judges “were honoured to be viewing such amazing results of the dedication and drive of the human spirit”. Winning photographs can be seen here .